Terry Huddleston sells his comic-themed artwork at one of Supercon's hundreds of booths. Claudia Zemora and daughter Elina dressed up as "Egyptian Queens" this year. Erlinkrany Rickman, 15, dressed as Darth Titus, a custom character he invented. Comic writer Andres R. Prieto, right, "The main character's name is Matteo, and he's a Cuban tobacco farmer who begins to discover that he's the reincarnation of a samurai." 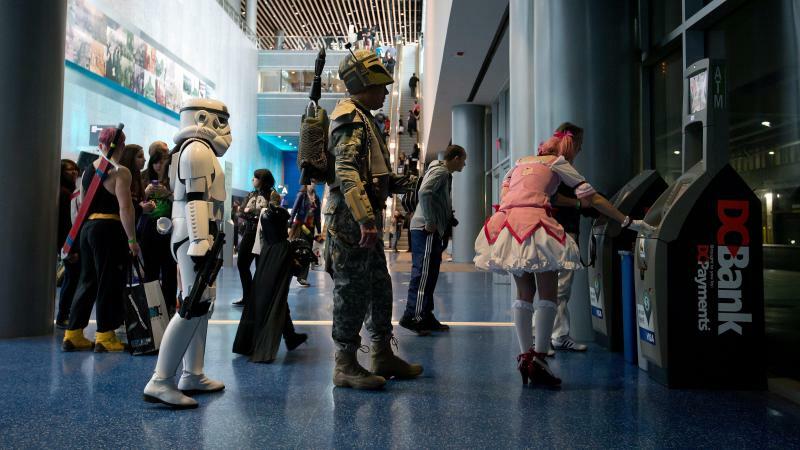 Princess Leia looks on as Andrew McClary maneuvers his R2-D2 robot through the Supercon crowd. "My son has cancer," he said. "He and I started this R2 together as a father-and-son project." When his son, Nicholas, 18, was too sick to help with the robot, McClary continued to work on it. "It kind of became my therapy of how I dealt with everything that was going on is to continue building R2 at night when I'd come home from the hospital," he said. Now McClary volunteers with a Star Wars-themed charity organization. He and R2-D2 visit hospitals, including one where his son has been treated. At Supercon, McClary and R2 stopped every couple of yards so someone could take a picture with the lovable droid. 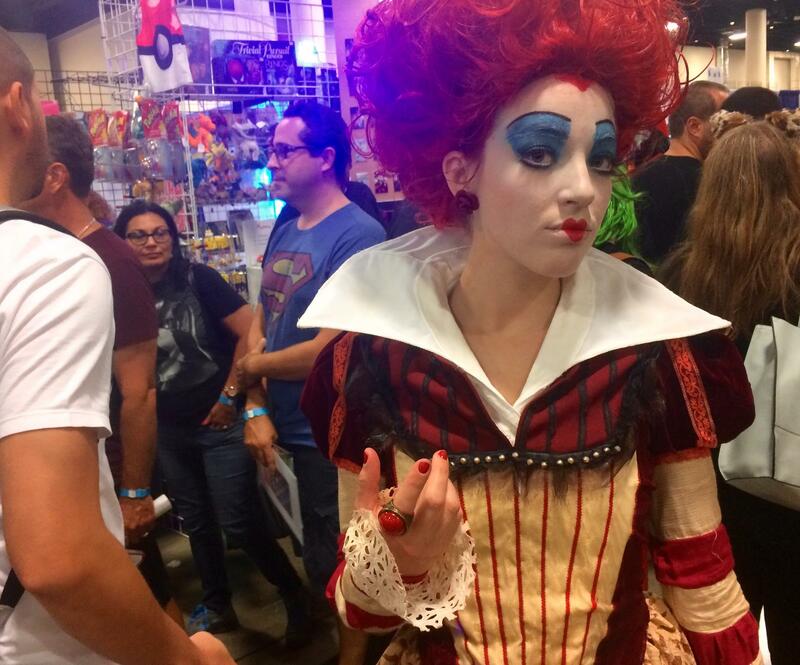 "I actually want to take him home with me," said Patricia Machín, who was dressed as the Red Queen from Tim Burton's Alice in Wonderland. She made her costume, an elaborate gown and red wig, from old fabric and clothes. She said she worked nonstop for about a week. "I have to stop sleeping and stop doing a lot of stuff," she said. Machín, who also goes by "Patty Cosplayer," moved to South Beach from Cuba less than a year ago. Before that, she helped to organize the cosplay scene in Havana. "We started creating ourself our own activities because we didn't have events like this one over there," she said. Organizers estimated more than 40,000 people attended over the course of the four-day event. Sandy Martin, vice president of Supercon, says when it started in 2006, fewer than 2,000 attended. "We just love doing this," she said. "It's what we spend every minute of our lives doing." Darren Tompkins attended his first comic convention (or comic con) in Roanoke, Va., back in the mid-1980s. At the time, these gatherings were only for die-hard comic fans — people who might invest in a Batman or Joker costume to wear once a year. "Really, it was just a small ballroom filled with cardboard boxes," Tompkins says. "I mean, there weren't any actors or famous people or panels or anything. It was just a place for comic book dealers to get together and sell their wares."